Objective: To investigate the effects of sedentary behaviours on the risk of epithelial ovarian cancer. Methods: A case–control study was conducted in China during 1999–2000. Cases were 254 patients with histologically confirmed epithelial ovary cancer. The 652 controls comprised 340 hospital visitors, 261 non-neoplasm hospital outpatients, and 51 women recruited from the community. The daily sitting duration in both occupational- and leisure-time was measured using a validated questionnaire. 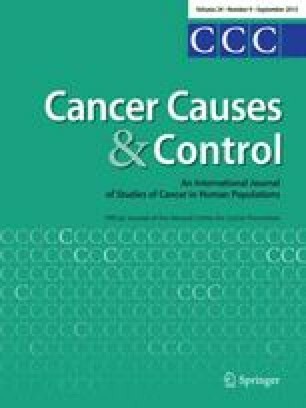 The risks of ovarian cancer were assessed using multivariate logistic regression analysis accounting for demographic characteristics, body mass index, familial factors, hormonal status, family ovarian cancer history, physical activity (as weekly metabolic equivalent tasks), and total energy intake. Results: Prolonged sitting duration was associated with an increase in ovarian cancer risk. The odds ratios were, respectively, 1.96 (95% confidence interval (CI): 1.2–3.2) with a significant trend (p = 0.007), 3.39 (95% CI: 1.0–11.5), and 1.77 (95% CI: 1.0–3.1) for high level versus low level of sitting at work, sitting while watching television and total sitting duration. Conclusion: Sedentary behaviours were associated with an increase in epithelial ovarian cancer risk.